CD30 antibody LS-C357756 is an unconjugated mouse monoclonal antibody to human CD30. Validated for ELISA, Flow, IF and IHC. CD30 antibody was raised against human CD30 recombinant protein. The antibody recognizes a single chain glycoprotein of 105/120kDa, identified as CD30/Ki-1. CD30 is synthesized as a 90kDa precursor, which is processed in the Golgi complex into a membrane-bound phosphorylated mature 105/120kDa glycoprotein. 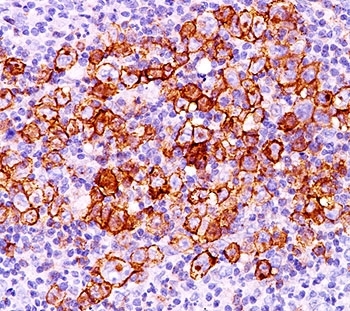 In Hodgkin's disease, CD30 antigen is expressed by mononuclear-Hodgkin and multinucleated Reed-Sternberg cells. It is also expressed by the tumor cells of a majority of anaplastic large cell lymphomas as well as by a varying proportion of activated T and B cells. This antibody distinguishes large cell lymphomas derived from activated lymphoid cells from histiocytic malignancies and lymphomas derived from resting and precursor lymphoid cells or from anaplastic carcinomas. About one third of the CD30 positive lymphomas lack the leukocyte common antigen (CD45). ELISA: Order BSA-free format for coating. CD30 antibody CD30/412 immunohistochemistry 20X-2. This image was taken for the unmodified form of this product. Other forms have not been tested. 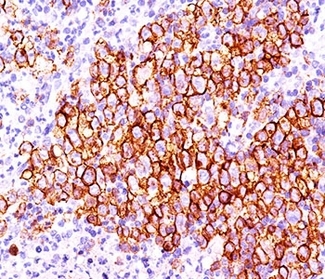 CD30 antibody CD30/412 immunohistochemistry 20X-1. This image was taken for the unmodified form of this product. Other forms have not been tested.